I love trying out new products so when Chemist Direct got in touch with me to offer me a voucher to spend on their website, I jumped at the chance. Being able to scour the website and pick out my favourite pieces to try out was a great opportunity for me and I can’t wait to tell you all about the goodies that I got. Today I’ll be sharing with you my haul and you can expect full reviews of all of the products coming up very soon. Chemist Direct stock a vast array of products from high end brands to affordable drugstore products as well as items suitable for travel, vitamins, healthcare products and they even stock pet health products. The products are usually limited in their number and sold at a discount compared to highstreet stores and other online retailers. 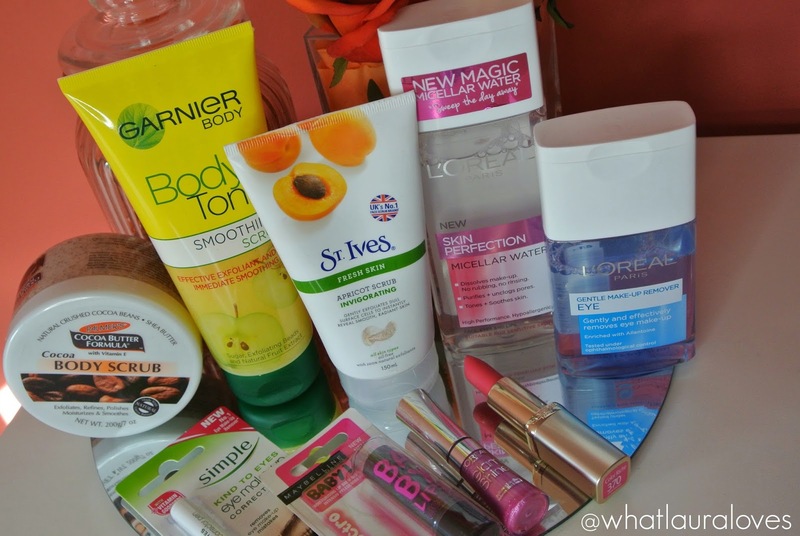 I was keen to try out products that from popular brands to see how they’d compare with some of my existing favourites. I put a little extra money to my voucher and got one of my favourite Clarins products of all time, the Water Purify One Step Cleanser. I’ve been using it for years and I really like how good it is at removing my makeup as the first cleanse in my skincare routine. It was a brilliant deal at £15.49 and I’m really pleased to have it back in my collection as I haven’t purchased it at the full price of £20 for a long time. This product sold out/discontinued on the Chemist Direct site pretty quickly as brands like Clarins are always in demand, especially if you can get them at a lower price. I think that Chemist Direct tend to get a set amount of stock of one product and once they’ve gone, they’ve gone so you really need to get them while you can if you see something you fancy. Cleansing waters are my favourite products to use to take off the layers of makeup on my face. 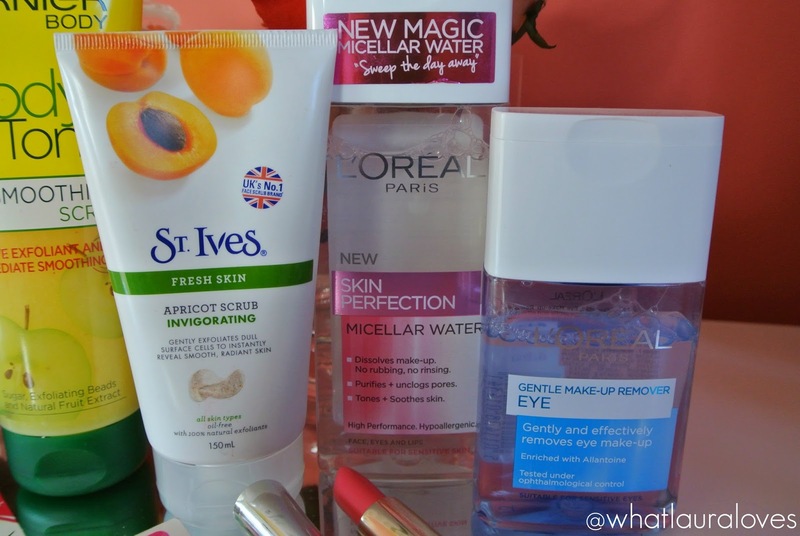 While I love the Clarins one, it is a bit of a treat as it is quite expensive and I’m always on the look out to try something new to see if it will do as good a job at removing my makeup. I’ve tried Bioderma and I do like it but I’d love to find an option that is more readily available to me and I’m pleased to say, I have that in these two products by L’Oreal Paris. The L’Oreal Skin Perfection Micellar Water is absolutely fabulous. It is really light, non sticky and removes all of the make up from my face comfortably. The same goes for the L’Oreal Gentle Eye Make-Up Remover which effortlessly removes all of my eye make up. It actually reminds me of my favourite eye make up remover by Klorane as it doesn’t sting the eyes at all and it doesn’t have an oily texture to it. I’m really impressed with these two products and I can’t wait to go into more detail about them in another post where I show you my favourite affordable skincare products. You can buy the Micellar Water here for £3.29, saving you £1.70 off the RRP. The Eye Make-Up Remover is available here for £3.19, saving you 88p off the RRP. When I saw that Chemist Direct had the St Ives Fresh Skin Apricot Scrub Invigorating Formula in stock, I knew immediately that I had to order it. This was a favourite skincare product of mine back when I was a teenager and I have always been searching for something to replace it from the drugstore ever since but I’ve never found anything that quite compares. My memories of this scrub match todays reality and I’m so pleased to have it back in my life. It is super gritty, really abrasive and does a fabulous job at sloughing away the dead skin from my face to leave a bright and smooth complexion. You can buy it here for £3.89, saving 10p off the RRP. Moving onto body products and I was pleased to find that Chemist Direct stock such a wide range of body products, all at discounted prices. 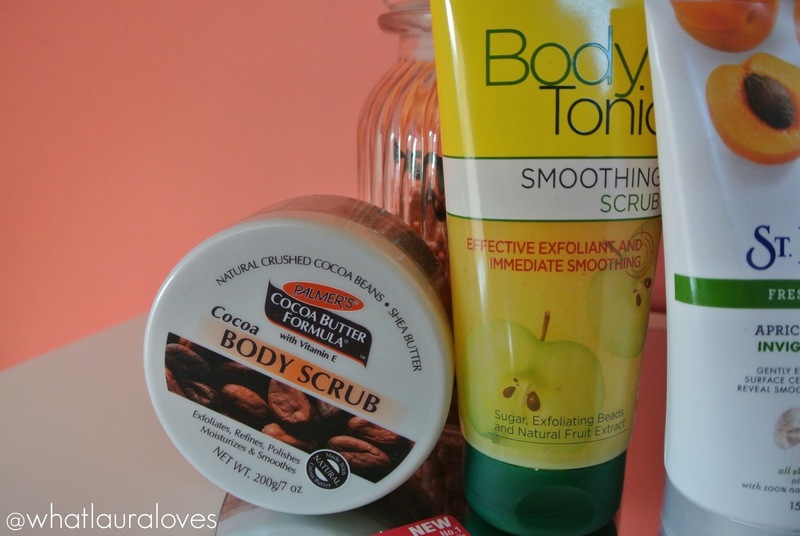 The Palmers Cocoa Butter Formula Cocoa Body Scrub has been a product that I’ve been wanting to try for the longest time as I’m a big fan of their body butter. I’m sure you all know by now how much I love body scrubs but I’ve got to say that this one isn’t up there with my favourites as it isn’t the most abrasive one that I’ve used and the scent isn’t all that great. I was expecting more from it but I’m really pleased that I’ve had the opportunity to try it as its been on my radar for a while. You can buy it here for £4.39 saving 60p off the RRP. The Garnier Body Tonic Smoothing Scrub was another scrub that I picked up and my favourite out of the two. It has a much more pleasing scent, slightly apple in fragrance and it feels great on the skin. It is a sugar scrub which I really like and found that it did a good job at exfoliating my skin. The solution that it is in is a little more slippy than I’d usually prefer but as I tend to use this on damp skin but out of the direct flow of water, this doesn’t cause a problem to me. Find it here for £4.99, saving £2.15 off the RRP. Sometimes when I’m getting to grips with a new mascara I end up getting a little on my eye lid or below my lower lash line before I’ve had a chance to get to grips with the wand properly. When I saw the Simple Kind To Eyes Eye Make-up Corrector Pen, I knew I had to try it to see whether it would help me to salvage my make up looks when such occurrences happen. I’m yet to try this out yet as I’m saving it for when I next switch over to using a different mascara (I’m a dab hand at the one I’m using right now!) as I’m worried in case it dries up if I open it before then. This pen is available here for £4.79 which is a saving of 20p against the RRP. Another product that I can’t wait to try out is the Maybelline Baby Lips Electro in Pink Shock. I’d been lusting after a Baby Lips ever since they first launched but I have resisted the urge to buy one until now because I was worried that it would just be a regular lip balm and Lord knows how many of them I have. I’ve looked at some swatches online and it actually looks as though this one is quite pigmented and leaves a pretty flush of pink on the lips. I’m going to try it out this week to create a pretty pink spring makeup look and I’ll let you know my thoughts on it when I write a ‘Face Of The Day’ style post. Pink Shock is available here for £2.69, saving you 30p from the RRP. Chemist Direct also have two other colours of these in stock to choose from; Berry Bomb and Oh Orange. Both of which are at the same price and discount as Pink Shock. If you’ve been reading my blog for a while then you’ll know how much I love my high end lip products. I love saving up and going to the Chanel counter for a splurge but I do also appreciate that this isn’t within everyones budget as well as the fact that even if it it, some people just don’t want to spend that kind of money on one lipstick. There’s nothing wrong with that and i’m a firm believer that there’s some fabulous products out there at affordable prices, especially where lip products are concerned. I thought that this would be a really good opportunity to try out a drugstore lipstick and I’m so pleased that I did. The L’Oreal Colour Riche Made for Me Lipstick in 370 Crazy Fuchsia is absolutely amazing. The formulation is so creamy and buttery soft that it applies effortlessly onto the lips. It is highly pigmented and imparts the most beautiful colour onto the lips, reminiscent of the popular Pink Flamingo nail polish by Barry M. I am SO impressed with it and will be showing you it up close in a blog post very soon. I would absolutely love to get my hands on some more of these lipsticks as the formula is SO GOOD. It is available here for £4.08 which is a whopping 50% off the RRP. I’ll definitely be keeping my eye on Chemist Direct in case more of the shades become available. One tip that I would recommend is that if you see a lip product on Chemist Direct, or any other website for that matter, that you like the look of, google the name of the product along with the word ‘swatches’ to pull up images of that lip colour in real life. Often you’ll find photos of the lipstick worn on a multitude of skin tones so you can see what it looks like when applied. When I saw Crazy Fuchsia online, I thought that it was going to be a light, soft coral but it is much more of a pinky coral in real life. I could tell this by the swatches on Google Images and I’m really pleased that I checked them out as it encouraged me to add this lipstick to my basket. 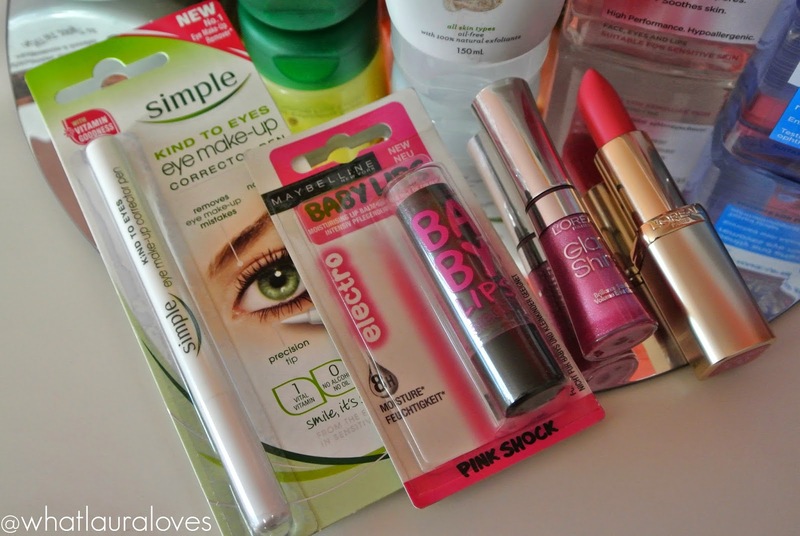 The last item that I picked up was the L’Oreal Glam Shine Lip Gloss. I’ve used this line of lip gloss in the past but in a couple of coral shades and I really like the look that they give the lips. I’m not sure what the correct name of this lip gloss shade is as online it says that it is 112 Sapphire Strass but on the packaging it says 112 Beryl Strass. I’ve tried googling the shades and they both look the same colour and I’ve seen both names listed to the name is a mystery to me. Perhaps they’re the same lip gloss but have a different name in the different countries they’ve been released in? I know that some UK products have slightly different names to their USA counterparts so perhaps thats what it is. Regardless, this lip gloss is gorgeous. It is a beautiful sparkly pink shade that looks lovely when worn alone but especially great when layered over the top of another lipstick, such as the other L’Oreal lippy I picked up in this haul. The Glam Shine Lip Gloss is available here for £5.59, saving you £1.40 off the RRP. So that’s everything that I got from Chemist Direct. I’m sure you’ll agree that for just over £50, I got a lot of different products to try out, as well as the Clarins cleanser that I haven’t photographed here with it not being currently available. I’m really impressed with the range of products and the discounts available on the website. If you spend over £35 then you automatically qualify for free delivery and you can get £5 off your first order when you click here. What are your favourite items from Chemist Direct? Have you ordered from them before? 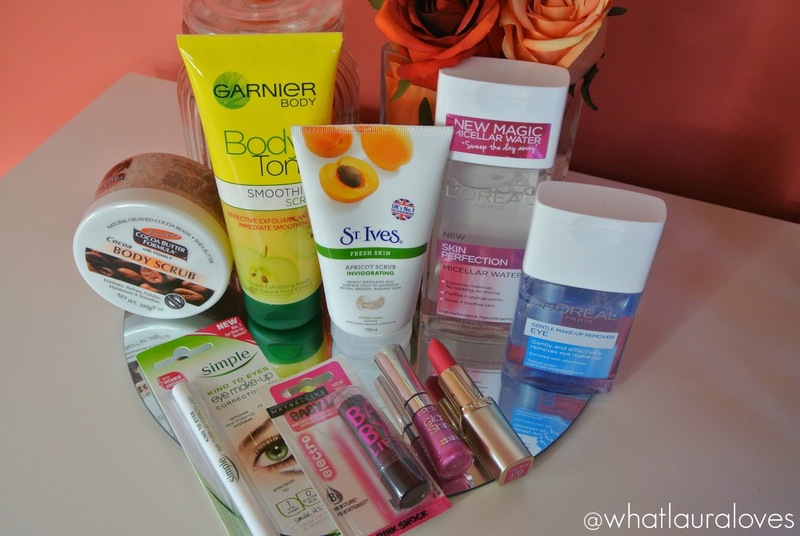 Can't beat a good Haul, not tried the palmers scrub will look for that, love the micellar water and the babylips. Omg I had no idea L'Oreal made a micellar water! It seems like everybody's coming out with one lately. I've never heard of Chemist Direct but it sounds like you've had a lot of success with them! That St Ives scrub brings back nightmares of being a Teen, that horrid peachy scent!